When shopping for a new kitchen faucet, you want to find a trustworthy company that you can commit to for as long as it takes. A kitchen faucet is not a fixture you want to be changing too often. To find that company, you don’t necessarily need to get acquainted with all the possible brands. The key is finding the best of them. And two brands that stand out in this industry are Moen and Delta. 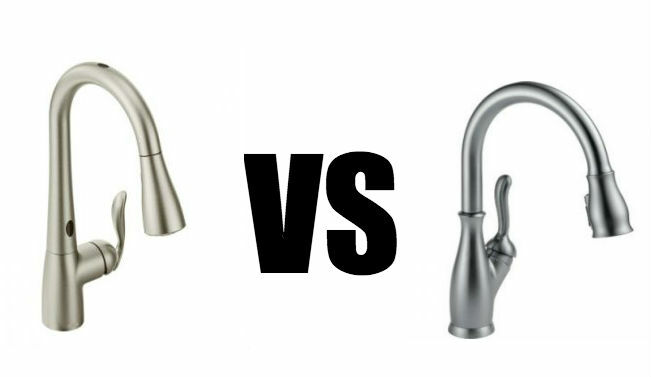 So in this article, we’ll go into Moen vs Delta comparison to understand which one is better. Both brands offer a variety of styles and designs, with probably the biggest selection among all brands. This makes it easy picking the style that would perfectly compliment your kitchen decor. Delta’s line of kitchen faucets includes traditional designs, such as the Leland collection; transitional designs, such as Essa; and modern designs, such as Trinsic. You can also find pull-down and pull-out designs. Moen offers commercial styled faucets, such as Align; traditional, such as Brantford; and modern, such as Arbor. There’s also a wide selection of both pull-down and pull-out models. As you probably know, the finish of the fixture is also a major element of the design. Picking the wrong finish might result in the faucet looking out of place among your kitchen decor even if it comes in the most amazing design. The two timeless finishes are chrome and oil-rubbed bronze. Chrome is a low maintenance finish that will sparkle year after year and which easily matches other elements of decor. Oil-rubbed bronze, on the other hand, is more suitable for traditional designs as it provides a lovely splendor of yesterday. These two brands, however, usually offer more than just these two colors. In addition to chrome and oil-rubbed bronze, other popular finishes that Moen offers include matte black and stainless. Most common Delta finishes include chrome, stainless, matte black and Venetian bronze. Moen and Delta also use different technologies to enhance the durability of the faucet’s coating. Moen uses Spot Resist technology, which helps to keep the finish clean and free of mineral buildup, fingerprints and water spots. Delta, on the other hand, uses the SpotShield technology, which essentially does the same. It resists water spots and fingerprints. However, in addition, it also provides antimicrobial protection. Both brands offer a wide selection of pull-down designs. This type of faucets allows the close-up power of a high pressure water stream. It makes it easier rinsing off any mess that has stuck to your dishes. However, Moen and Delta use different technologies for delivering this jet-like water stream. Moen uses the Power Clean technology. It provides an optimized, concentrated spray that is 50% more powerful than most other pull-down faucets. At the same time, this power does not result in more splash. Instead, the produced spray is contained, creating minimized mess around the kitchen sink area. Delta uses the ShieldSpray technology. It’s also designed to provide a more powerful jet of water to make it easier cleaning away any mess on your cookware. However, it also creates a protective sphere around the concentrated jet. This also helps to prevent splatter. Moen and Delta also offer the convenience of touchless operation. But again, they use different technologies. Moen uses the MotionSense technology that integrates sensors inside the faucet. Some models come with one sensor, while others have two. One is located on top of the spout and the other in front of the spout’s base. So all you need to do is wave your hand or any object over the faucet or in front of it. This will activate the water flow. Delta offers both touch and touchless operation. The touch functionality is provided by the Touch2O technology. It makes the faucet’s body and handle intuitive to your touch. So if you don’t want to spread the dirt from your hands to the faucet, just tap it with the back of your hand and it will get the water going. If you want the completely touchless operation, Delta also designed the Touch2o faucets with built-in motion sensors. Though, most of the Delta kitchen faucets only have the touch technology. Both of these companies seem to have a good share of good and bad reviews. Some say it’s difficult to get a hold of them for requesting replacement parts, while others praise how friendly and helpful they are. Both companies provide a limited lifetime warranty. So if you’ll find any defects in material or workmanship, you can request the company for a replacement. However, the commercial use of their faucets shortens the warranty period to 5 years. The same goes for electronic faucets with touch or touchless technology. They come with a 5-year warranty. Most people want to find a faucet that would fit their specific budget. The good news with both Moen and Delta is that you can find a faucet in any price range, from $50 to a $1000. However, Delta faucets tend to be slightly cheaper. It’s important to note that a lower priced Moen or Delta faucet doesn’t necessarily mean inferior quality. They deliver high quality and durability across the entire price spectrum. The price of the product depends more on the features and functions it offers. As you can see, there are many similarities between Moen and Delta. They score similarly in terms of style and function. Both provide highly durable products that will provide you with high performance for years to come. There are also a few differences also. Those that prefer affordable faucets, often choose Delta, while those that want the touchless operation, prefer Moen. If you’re still not sure which brand to choose, check out their product reviews and compare the designs and features they offer.